I'm just curious as to what Brewery You Specialize in and how many Cans You may have from that Brewery?....For Myself Pabst Dominates the Shelves....This includes all Brands Produced by Pabst.....I have 57 Cans in all....What do You have? Re: What Brewery do You have the most Cans from? I'm originally from va and you can't walk 5' without kicking one! Cool! ....I just do Milwaukee Pabst and only Flats Zips and Straight Steel Pull Tops and the 3 Quarts. Cool how many do You have? Drewrys. The most common brand that I dump. Hoping to dump a Bock or ale soon. My specialty is American straight steel tabs. I have 191 different cans from Associated and their various subsidiaries. (Sterling, Pfeiffer, Old Dutch, Drewrys, Jacob Schmidt, Atlantic, S. Edelweiss, et al) That includes around 60 variations of Schmidt scenes. Last edited by jinsequa on Sat Apr 13, 2019 11:50 am, edited 1 time in total. Since I collected currents until about 2000, I'd guess it's AB. Could be Magnify (my local craft brewery which produces massive quantities of new cans). I also have a whole bunch of Ballantine cans, nearly all of which are 12 oz. 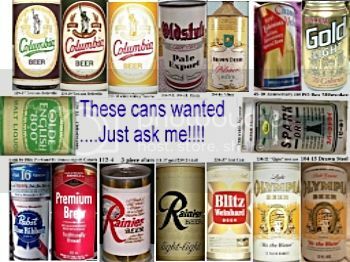 That's really Cool All the Cans You Guys get to look for!....I thought Rainier would be one Brewery with Hundreds of Cans to find! Sounds like Associated and Drewerys has alot as well...Leon I always liked Your Altes Can pictures!....I would think there is a Ton of Black Label's to! Heileman is a close second to Pabst in My Collection!...With all of the Breweries the bought up in the 60's and 70's. I have 70 different cans from Goebel Detroit. 49 Cans from Schlitz and 37 from Miller and 34 from Heileman. Interesting question. I wish I had more from the brewery's I collect, but off the top of my head, I'd say St. Claire. I've managed to acquire all seven of the known cans, and that was no small effort. When I was biking to high school, I used to ride past the only remaining building where it used to be. Sadly, the building has since been torn down. Awesome!...If I had room I would really like to go after Maier and Grace Bros. Cans!....Those are My Favorite Non-Wisconsin Breweries! !....I do have like a 25 Can Collection of those 2 Breweries nothing Special. Well, I collect Atlantic of course, but there are only 8 cans from them. That would be 5 cones and 3 flat tops. Most of the cans I have are from Carling Atlanta (1958-1973). I'm only missing a few. Carling Atlanta cans , etc. Probably close to 700 from Rainier in Washington (San Francisco excluded) but that's split between Seattle and Spokane. Is that more than one brewery? Runner up would likely be Grace Bros.
Do the cans have to be different? I have about 50,000 cans from Olympia that are buried in various pits scattered around the Northwest due to space constraints at home. No that's one Brewery....I was waiting for a Rainier Collector to Post!.....700 Cans that's Cool! !....Grace Bros. Cans are Awesome! !....So many Cool Labels!.....My favorites are Clipper and the Yellowish Orange GB OI. Toss up between Tivoli and Walters Brewing. I tend to pick a brand/brew from each country and collect the variations from first can to some arbitrary stopping point. So I do not collect all Castlemaine cans such as Lite, Export, Gold, special issues, etc... - just XXXX Bitter Ale for instance. Last edited by Mark (expired) on Sat Apr 13, 2019 9:14 am, edited 1 time in total.